East side from Wildcat, December 1, 2018. Photo courtesy of Jay Philbrick Photography. Winter came early this year with almost 110” of snow on the summit before December rolled around. Skiers and riders enjoyed the deep soft snow, while warmer temperatures at lower elevations didn’t keep ice climbers happy. Typically, climbers can find an early season fix on ice in Tuckerman and Huntington but all the new snow made for particularly unenjoyable postholing to reach climbing objectives. As of today, we are one week into our first season of writing five-scale forecasts for the Presidential Range. During this week, we’ve visited and made observations in the Great Gulf, Gulf of Slides, and of course, Tuckerman and Huntington Ravine. The team here at MWAC are all fans of snow…the more, the better usually, but the early snowfall and growing need to move to a five-scale advisory advanced our schedule quite a bit and sent us scrambling to complete all the usual pre-season tasks. At the same time that we were prepping sleds, SAR caches, and the usual day to day task that accompany government employment, we were honing a brand-new process to produce and disseminate an advisory. Mother nature and winter arrive on their own schedule and, inconveniently, not according to our calendar! Our new website and forecast presentation presented some unexpected challenges and we are currently playing catch-up to complete our planned projects. I’m writing to update you on our progress. Our ultimate goal with the new website is to provide all of the information that we use to create an avalanche forecast. All the information on the Forecast page (formerly Advisory page) will be useful to you, as well, to apply to your travel plans in the mountains. As previously, the snow, weather and avalanche information is presented in tiers that correspond to our estimation of their order of importance starting with an overall danger rating. Since we have a wide range of levels of experience and education among our readers, the information is laid out strategically from the most basic, which is the danger rating, through mountain weather factors that affect snow conditions, down to raw snow and weather data. If you want only the most basic guidance, read the Bottom Line section at the top. If you want to dig deeper to develop a more nuanced understanding of the snow, keep scrolling down into snowpack and avalanche observations and on to the raw snow and weather data from local snow study plots. 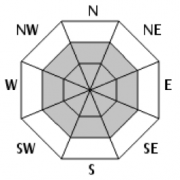 Terrain rose – This graphic will be associated with each avalanche problem type. The example shown could be one we might use after a period of unsettled weather passes to describe a storm slab problem that developed due snowfall at higher elevations. The elevation bands we’ll use will be in elevation bands with Presidential range ravine elevations generally occupying the middle band. The lower elevation band will be around 3,500’ with the upper band being 5,500’ and up. The terrain rose graphic, like our forecast map, is not meant to serve as a navigational tool but as a learning and visualization tool to help you understand and remember the distribution of the problem so you can look for it in the field. The vast majority of our avalanches occur at the elevation of the ravines. Notable exceptions exist above and below that elevation, such as the slide paths in Crawford Notch and the summit cone. This tool can help communicate when that kind of avalanche problem exists. The graphic will be adjacent to the avalanche problem icon with the chance and size sliders. Observations section – We will be displaying our field observations and photos below the Additional Concerns section of the advisory. There will be a link for you to use to upload photos and videos along with some simple fields to fill in. A photo and a location may be all that you want to contribute but there will be options for more elaborate, professional level observations as well. 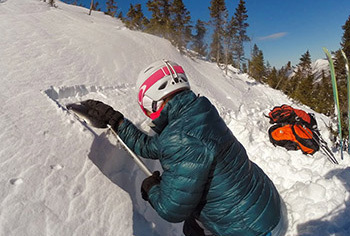 Snow pit data, avalanche debris photos, crown profiles and other info can be super helpful to us and the reader but they aren’t the only things that can help folks form an image of conditions they might encounter in the field. Snowpack information – Snow Rangers have been recording and compiling snow and weather data at two snow study plots near Hermit Lake and Harvard Cabin since 2003. Last season, we began to publish Hermit Lake data daily on the website, which includes key 24 hour and storm snow totals along with settlement and snow temperatures. The AMC caretaker gathers this information early in the morning and publishes it to our database and website so we can use it to help formulate the avalanche advisory. As the Harvard Cabin becomes fully staffed and operational, we may also publish similar information from there. 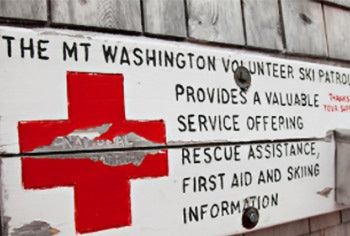 This year, the caretakers and the Randolph Mountain Club have stepped up to help and will be collecting the same data from a small clearing near Gray Knob cabin near 4,400’ feet on the northwest shoulder of Mount Adams. 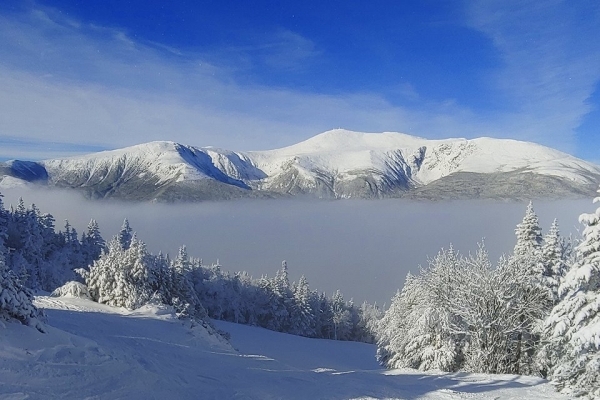 Along with weather data from the good folks at the Mount Washington Observatory, we have the snow and weather data we need to develop a reasonably accurate forecast. Our mission in the future is to continue to expand this network and further inform our forecasts. Since snow and weather change quickly and can be remarkably different spatially, we will continue to fill in the gaps with the existing MWObs mesonet along with direct field observations from staff and the public. Avalanche forecast in your email – In the past, we have directed people to sign up for our email advisory by using a third-party app such as IFTTT or some other RSS feed. We did this to avoid the direct cost to our program for using a mail handling program such as MailChimp. To make it easier for you to sign up, and for local cooperators to print our new, graphics heavy forecast, we’ll be using MailChimp or another product to send the daily forecast directly to your inbox. We’ll using some of our limited funds to make this happen but we feel that this will help folks get the info more readily in their mobile devices when traveling to the mountain. We’ll provide a link for signing up soon. I hope this helps to answer some of the questions that folks have been asking in the past week or two. We’ll continue to try to help you use the new tools by posting information on how and when to use them. Or better yet, sign up for an avalanche course from a local guide service! As we move further into the season and refine the product and our new forecast process, feel free to reach out with any questions or feedback to our staff at mwactucks@gmail.com. Have fun out there!